All of the news found in this section is believed to be accurate until notified otherwise. Unless the person sending in the information is a chief, purchasing agent, or sales representative from the dealer, there is no way for me to verify each individual piece of information. If you read any information in which you believe is inaccurate, please email me. Before sending in apparatus order information: Please verify that it is true and correct. While I know everyone has the best of intentions and mean well, posting order information that is not true can be detrimental. Many chief officers and apparatus dealers read this site and posting an order that has not actually been placed can cause hard feelings and tension between a department, the town, and the sales people. So, please make sure your information is accurate before submitting it. Thank you. Stanidsh, ME Volunteer Firefighter/U.S. Marine Tyler Wallingford killed in shooting. CLICK FOR ARTICLE. LODD- Argyle, SD Volunteer Firefighter Dwain Hudson passed away after suffering a medical emergency while enroute to a wildfire. Block Island, Rhode Island Fire Department- acquires utility vehicle. CLICK FOR ARTICLE. Rye, New Hampshire Fire Department- has placed an order with E-One for a ladder truck with 100' aerial. It will also have a pump and a water tank. Adams, Mass Fire Department- voters to decide in May on two full-time positions. CLICK FOR ARTICLE. Amesbury, Mass Fire Department- to undergo staffing review. CLICK FOR ARTICLE. Middleboro, Mass Fire Department- graduating recruits earns award. CLICK FOR ARTICLE. Pittsford, Vermont Fire Department- considers moving sub-station. CLICK FOR ARTICLE. Portsmouth, New Hampshire Fire Department- 1863 firehouse to be restored, 100th anniversary of central fire station coming in 2020. CLICK FOR ARTICLE. Shelton, Connecticut- new dispatch facility improves regional communications. CLICK FOR ARTICLE. Springfield, Mass Fire Department- has changed ladder truck designations from Ladder to Truck. They also re-numbered two of their ladder companies. Ladder 1 is now Truck 1, Ladder 8 is now Truck 2, Ladder 3 is now Truck 3 and Ladder 9 is now Truck 4. West Barnstable, Mass Fire Department- has added 14 new volunteer firefighters. Anthony O'Donnell, Craig Drew, Kerry Williams, Stephen Brunelle, Justin Clark, Shea Allard, Kevin Flynn, Austin Osborn, Brandon Haughton, Devon Crowl, Austin Moloney, Sean Crimmins, Ryan Dipilato, and Matt Antoine. Maine ambulance dedicated to fallen Somerset County Sheriff's deputy. CLICK FOR ARTICLE. Maine State Trooper Ben Campbell was killed on I95 when a truck tire came oose and struck him while he was assisting a disabled motorist. Retired Glastonbury, CT Deputy Chief Donald “Pete” Cowles passed away on Wednesday, April 10th. Retired Lawrence, MA Firefighter John Carroll passed away on April 4th. John served as union president, was an EMT/Dispatcher for LGH and Northeast CMED, and a Vietnam Veteran. FDNY Firefighter Christopher A. Slutman, 43, of Ladder Company 27 in the South Bronx died as a result of injuries sustained while on active duty in Afghanistan, while serving in the United States Marine Corps on Monday, April 8. Chilmark, Mass Fire Department- purchases used fast attack truck. CLICK FOR ARTICLE. Hudson, New Hanpshire Fire Department- recently placed another Seagrave FasTrack pumper into service as their Engine 4. This is their second Seagrave engine in the last 18 months. The all stainless steel 1,500 GPM pumper with 750 gallon tank has been assigned to station 4 in the south end of town. North Branford, Connecticut Fire Department- town council has opted not to fund a new tower-ladder at this time. Plymouth, Mass Fire Department- has on order an E-One ladder truck. Portland, Maine Fire Department- Rosenbauer has completed construction of an ARFF crash truck for the Jetport. Delivery will take place sometime after the FDIC where it is on display. Wolfeboro, New Hampshire Fire Department- recently took delivery of a 2,500 gallon Seagrave Pumper-Tanker. The tandem axle unit features a 500HP engine, raised roof, 1,500 GPM pump, deck gun and a short wheelbase for better access to tight areas. The all stainless steel unit will run first due outside the hydrant district and also be primary on Mutual Aid. Bucksport, Maine Fire Department- Fire Chief Craig Bowden hsa retired after 40 years of service. 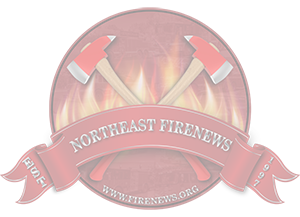 Lincoln, Rhode Island- legislation introduced that would consolidate fire districts. CLICK FOR ARTICLE. North Conway, New Hampshire Fire Department- funds have been approved for a feasability study for a new fire station. CLICK FOR ARTICLE. Plymouth, Mass Fire Department- contractor selected to build new North Plymouth Fire Station. CLICK FOR ARTICLE. Portsmouth, New Hampshire Fire Department- has named Captain Todd Germain as Interim Fire Chief, which will take effect at the end of the month. Portsmouth, Rhode Island- Fire Marshal William Ethier has retired after 23 years of service. Rutland Town, Vermont- Fire Warden honored for 40 years of service. CLICK FOR ARTICLE. Saugus, Mass Fire Department- 2 firefighters promoted. CLICK FOR ARTICLE. Skowhegan, Maine Fire Department- receives grant for apparatus headsets. CLICK FOR ARTICLE. Maine Fire Marshal releases report on LODD fire in Berwick. CLICK FOR ARTICLE. Dracut, Mass- Firefighters shave heads in solidarity with firefighter battling cancer. CLICK FOR ARTICLE. Plymouth, Maine- Firefighters hold fundraiser to pay for assistant chief's funeral. CLICK FOR ARTICLE. Rochester, Mass Firefighters and Explorers walk for one of their own. CLICK FOR ARTICLE. Former West Haven, CT Firefighter James Woodman passed away. He was injured on the job on October 5, 1999 only 2 days out of the academy. He was seriously injured after the ambulance he was riding was involved in a crash. He would not work as a firefighter again after that accident. Retired Fairfield, VT Fire Chief Lyndon Corey passed away. Burlington, Mass Fire Department- has on order a Piece Quantum pumper. Yantic Fire CO (Norwich, CT)- has placed an order with Pierce for a pumper built on an Enforcer chassis. It will carry 770 gallons of water and 30 gallons of foam. Brunswick, Maine Fire Department- funding approved for new fire station. CLICK FOR ARTICLE. Danbury, Connecticut Fire Department- Tim Smith has been named as the new Deputy Fire Marshal. Millbury, Mass Fire Department- Firefighter Steven Couture has retired after 20 years of service. Pittsfield, Mass Fire Department- Fire Chief Robert Czerwinski has announced he will retire in July after 32 years on the job. Wayland, Mass Fire Department- Sherborn Deputy Chief Neil McPherson has been selected to be the next fire chief in Wayland. Retired Revere, MA Deputy Chief George P. Taglieri Jr passed away at the age of 78. He was also a veteran of the U.S. Army and served during Vietnam. Retired Vermont Firefighter Robert M. Beattie Sr passed away at the age of 87. He served the Stowe Fire Department for 40 years and then another 20 years with the Mount Snow and Lake Hiawatha Fire Departments (he was assistant chief in Lake Hiawatha). He also was a veteran of the U.S. Navy. Retired Hope Valley-Wyoming, RI Fire Chief Frederick Stanley passed away at the age of 83. U.S. Forest Service Captain Daniel J. Laird, 41, of the Tahoe Helitack, CA crew was killed in a helicopter crash during a controlled burn. Hingham, Mass Fire Department- Pierce is nearing completion of the department's new 100' tower. The rig also features a pump and water tank and is expected to be delivered to the department sometime in late April. Livermore Falls, Maine Fire Department- town meeting did not pass a request for funds to purchase a new ladder truck. Seekonk, Mass Fire Department- a new pumper is in production at the Ferrara plant with delivery due sometime in the spring. Springfield, Mass Fire Department- Engine 3 damaged when hit by drunk driver. CLICK FOR ARTICLE. Truro, Mass Fire Department- has in production a Pierce tanker built on a Freightliner 114-SD chassis. It will feature a 500 GPM pump and a 3000 gallon water tank. Delivery is expected sometime in the spring. Westborough, Mass Fire Department- voters approved funds to purchase a new tower-ladder. East Greenwich, Rhode Island Fire Department- has selected Assistant Chief Bernard L. Patenaude of the Cranston Fire Department to be the new Fire Chief. Middleton, Mass Fire Department- Town meeting approved the purchase the Middleton Golf Course located on Route 114. The town will build a new town center which will include a new fire station, police station, town hall, and senior/community center. The fire station is slated to be built first with completion in 2022. Nahant, Mass Fire Department- off duty firefighter runs into burning building and saves 13. CLICK FOR ARTICLE. Newburyport, Mass Fire Department- FD considers providing ambulance service. CLICK FOR ARTICLE. Norwalk, Connecticut Fire Department- swears in three, promotes one. CLICK FOR ARTICLE. Plymouth, New Hampshire Fire Department- with chief retiring, others are moving up. CLICK FOR ARTICLE. Tilton-Northfield, New Hampshire Fire District- Fire District to remain intact. CLICK FOR ARTICLE. Pierce recalls more than 800 vehicles. CLICK FOR ARTICLE. The Coast Guard Cutter Terrell Horne (WPC-1131), a California-based 154-foot Fast Response Cutter (FRC), was commissioned in San Pedro, Friday. Retired Arlington, MA Firefighter John "Jack" E. Cuqua passed away on March 9th at the age of 82. Providence, RI Retired Chief of Department Al Bertoncini passed away on March 20th. LODD- Philadelphia, PA Firefighter Michael Bernstein, 46, passed away after suffering a medical emergency while on duty. Brookline, New Hampshire Fire Department- town meeting approved funds to purchas a new ambulance. Canterbury, New Hampshire Fire Department- Voters approved purchase of a 2019 Ford F-350 which will serve as a utility vehicle. Charlestown, New Hampshire Fire Department- a request for funds to purchase a new pumper did not pass at town meeting. Deering, New Hampshire Fire Department- town meeting approved funds to purchase a new pumper. Egremont, Mass Fire Department- has ordered a 2019 Ford F-550 4x4 2-Door / Rosenbauer light duty rescue. It will be delivered in October. Fairfield, Connecticut Fire Department- funds have been approved to purchase a new Pierce Ascendant tower-ladder for Ladder 2. Hinsdale, New Hampshire Fire Department- funds were approved to purchase a new brush truck. Hollis, New Hampshire Fire Department- town meeting approved a lease/purchase agreement for a new pumper. Loudon, New Hampshire Fire Department- funds were approved to purchase a new ambulance. Mont Vernon, New Hampshire Fire Department- a request for funding for a new pumper did not pass at town meeting. Newton, New Hampshire Fire Department- Engine 1's 2000 E-One Protector 1250/1000 has returned to service after being refurbished. Willimantic (Windham, Connecticut) Fire Department- E-One has completed construction of the department's new Metro ladder truck. Once in service, it will replace a 1977 Maxim ladder and a 1997 Freightliner rescue. Bucksport, Maine Fire Department- Fire Chief Craig Bowden has announced he will retire in April after 36 years of service. Danbury, Connecticut- with fewer volunteers, fire companies consider consolidation. CLICK FOR ARTICLE. Fremont, New Hampshire Fire Department- town meeting approved funds to fund fire and EMS coverage on the weekends. Greenland, New Hampshire Fire Department- the warrant article for funding to build a new fire station did not pass at town meeting. Lynn, Mass Fire Department- swears in 20 and promotes 5. CLICK FOR ARTICLE. Newbury, New Hampshire Fire Department- the warrant article for fudning to build a new fire station did not pass at town meeting. Newton, New Hampshire Fire Department- the new Public Safety Complex is open and operating. It is located at 8 D Merrimac Road and replaces Station 1. Pepperell, Mass Fire Department- has an opening for a full-time Firefighter/Paramedic and a full-time Fire Chief. CLICK FOR TOWN PAGE. Southborough, Mass Fire Department- has selected current Portsmouth, NH Fire Chief Steve Achilles to be the next fire chief. Thorndike, Maine Fire Department- fire department now a municipal agency. CLICK FOR ARTICLE. Oxford, ME Fire Chief Gary Sacco, 63, passed away after suffering a medical emergency at the services for fallen fire Captain Joel Barnes. Jamestown, RI Retired Fire Chief Joseph W. Tiexiera passed away at the age of 84. Wells, ME Retired Fire Chief Norman V. Brown Sr passed away at the age of 76. Harrisville, RI Firefighter Ryan J. Ferris, 39, passed away from injuries received in a motor vehicle crash. Raymond J. Chaput, 87, passed away on March 10th. He had served the Twin Mountains, NH Fire Department as a fire warden, arson investigator and also worked on the ambulance. Bow, New Hampshire Fire Department- voters approved funds to purchase a new pumper. Elmore, Vermont Fire Department- voters approved funds to purchase a new pumper. Lawrence, Mass Fire Department- has placed an order with Pierce for a new rescue/pumper. It will be assigned to Engine 5 upon delivery. Engine 5's current piece will be reassigned as Engine 8 with the plan to put that company back in service. Malden, Mass Fire Department- has placed an order with E-One for a Cyclone-Metro 100' Rear Mount ladder truck. New Hampton, New Hampshire Fire Department- funds have been approved to purchase a new pumper. Rye, New Hampshire Fire Department- funds have been approved to purchase a new quint-type ladder truck. Waterville Valley, New Hampshire Fire Department- funds have been approved at town meeting to purhase a new ladder truck. Williston, Vermont Fire Department- a 1.4 million dollar bond has been approved to replace three aging pieces of equipment. They will be replacing their tower-ladder, an engine and a brush truck with a new ladder truck and a mid size engine. Boscowen, New Hampshire Fire Department- Fire Chief Ray Fisher retires after 56 years of service. CLICK FOR ARTICLE. Danbury, Connecticut Fire Department- has named Terry Timan as the new Fire Marshal. Danville, New Hampshire Fire Department- a warrant article for funds to build an addition to the public safety building did not pass. New Boston, New Hampshire Fire Department- a request for funds to build a new fire/EMS station failed at town meeting. Northwood, New Hampshire Fire Department- a request for funds to build a new public safety complex failed at town meeting. Oakfield, Maine Fire Department- has occupied their new station located at 5 Station Street. Portsmouth, New Hampshire Fire Department- four firefighters promoted. CLICK FOR ARTICLE. Twin Mountain, New Hampshire Fire Department- voters approved funding for a new public safety building. Warwick, Rhode Island Fire Department- the mayor has selected retired Fire Marshal Peter K. McMichael to be the new Fire Chief. CLICK FOR ARTICLE. Windham, New Hampshire Fire Department- voters approved a warrant article to hire four additional firefighters.